Stamp Collector or Literary Genius? Yesterday I was bemoaning the repetitious nature of my Food Security Challenge diet. Today, I was able to do something about it, to get some new ideas, to get stimulated about nutrition again. I didn’t put my feet up and watch the cooking channel hoping that some inspiration would magically transfer to me through the airwaves. 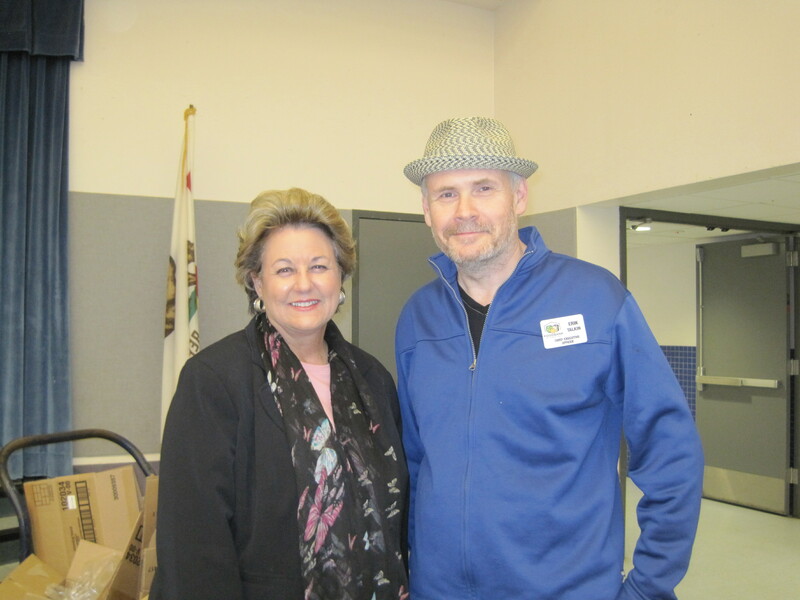 No, instead I headed down to the Foodbank’s Healthy School Pantry at Isla Vista Elementary school. 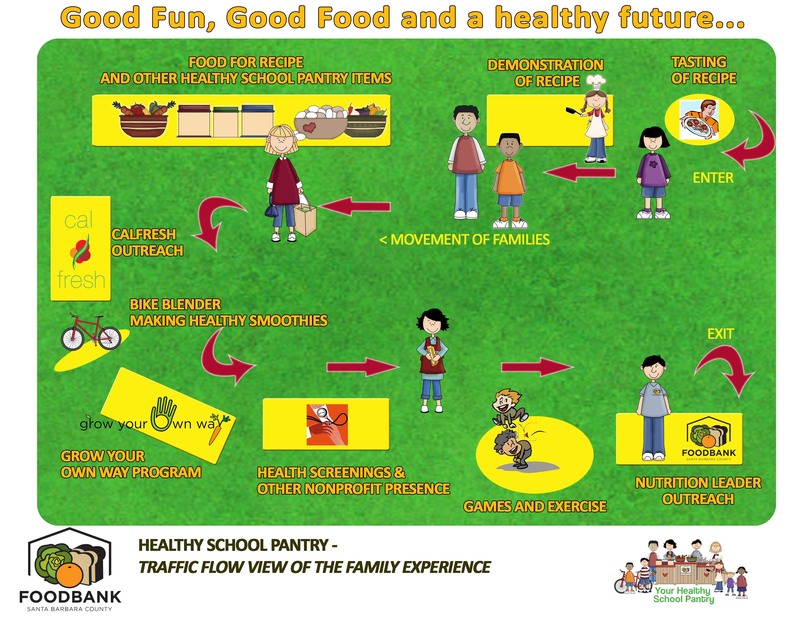 Healthy School Pantry is a program we are very excited about at the Foodbank. Last year we won a national Hunger’s Hope Award for the program as the best child nutrition program in the country. The concept behind HSP is that you can’t help people become more food secure by just giving out food. You have to provide the education – what we call the ‘food literacy’ – for families to make effective and economic use of the food they have. Many of us are reasonable cooks and smart about what we buy, but a lot of those skills can go by the wayside when people are incredibly busy. The easy solution is sought out and that is usually not very healthy. Also we do see families where the parents are pretty much heat and serve. The grandparents can cook, but the parents have forgotten, were never taught or are too busy. I’m finding in my own challenge that food literacy skills are not something that is nice to have, but that are absolutely essential if I am going to make it through the month with very little money for food, but still wanting to stay healthy. How can I stretch my food stamp dollars? How can I utilize that large quantity of a carrots that I got from the food distribution before they go bad? We made the decision to focus a lot of energy on a series of programs for kids, called Feed the Future, which starts food literacy training at the youngest age possible and then builds on skills all the way until high school graduation. This is not going to stop people losing their jobs, or avoid the effects of a national recession. What it will do is give them the skills to take the modest safety nets we have (food stamps and Foodbank/Member agency food distributions) and utilize them to stay healthy. The great thing is that these ‘survival’ skills are really ‘thriving’ skills, because they are equally applicable in better economic times. Using good nutrition to be healthy is the number one preventative health tool we all possess, and Feed the Future is designed to make it available to all. So, what did I find down at IV Elementary School? Not some food distribution where everyone is standing in a line, feeling disempowered, but an exciting circle of activities where people are learning how to cook a delicious dish, how to grow more of their own food, about nutrition and even having some some fun and games on our bike blenders. My first stop was to see Foodbank community health volunteer Angie Rios and Foodbank Health Education and Evaluation Manager Serena Fuller and the recipe of the day they were demonstrating. The good thing about HSP is that it provides the actual ingredients you need to cook the recipe that is featured. That may not sound like much, but in the food bank world, where we are used to just giving out the food we have on hand, it is an epic achievement. 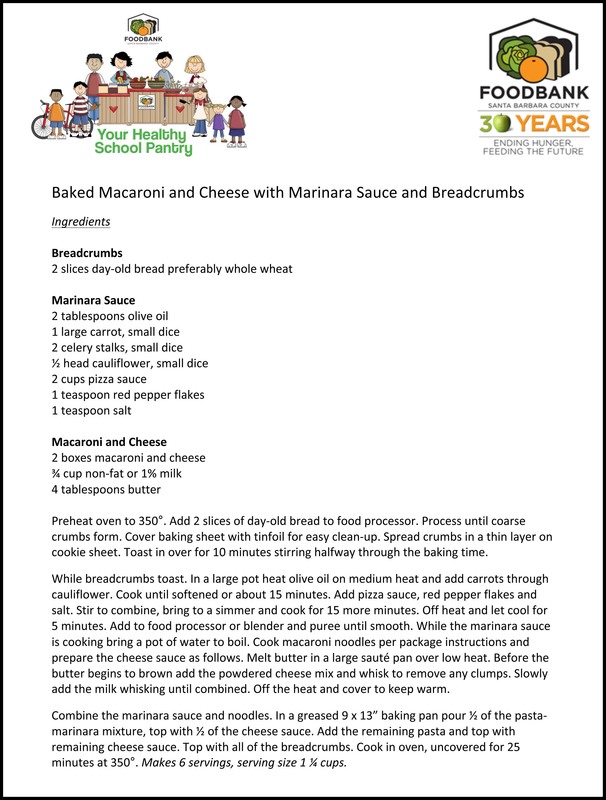 This recipe used basic ingredients like a boxed macaroni and cheese and a bagged marinara sauce that were both availabe at the Foodbank and then incorporated minutely diced celery, carrots and cauliflower to make a dish that was not only incredibly good for you, but down right delicious and wolfed up by hordes of kids, never suspecting just how many fresh vegetables they were ingesting. 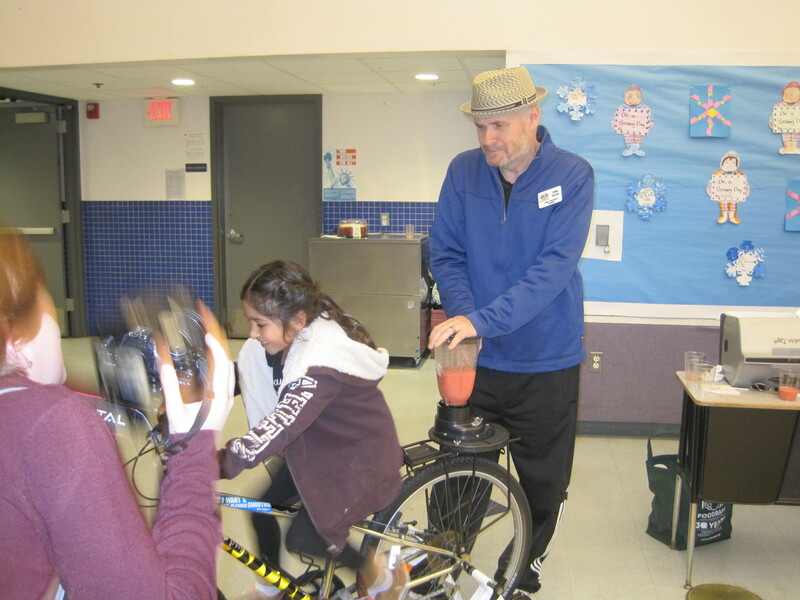 Whilst at the HSP, I had to try out a healthy smoothie using the amazing bike blender. Last month we made an amazing smoothie with kiwi fruit, bananas and spinach, where no kid noticed the spinach and everyone loved it. This time we had frozen strawberries with bananas and apple juice. 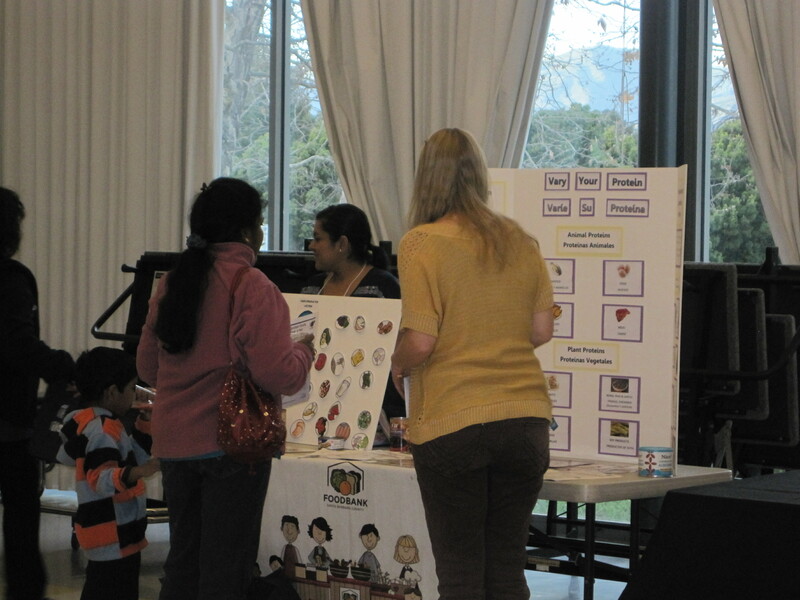 People were also learning about nutrition from Justine Meyer, our Dietetic Intern. A key component of HSP is a chance to get involved in our Grow Your Own Way program Program Manager Oscar Carmona shares some spinach seeds and the skills to plant them. 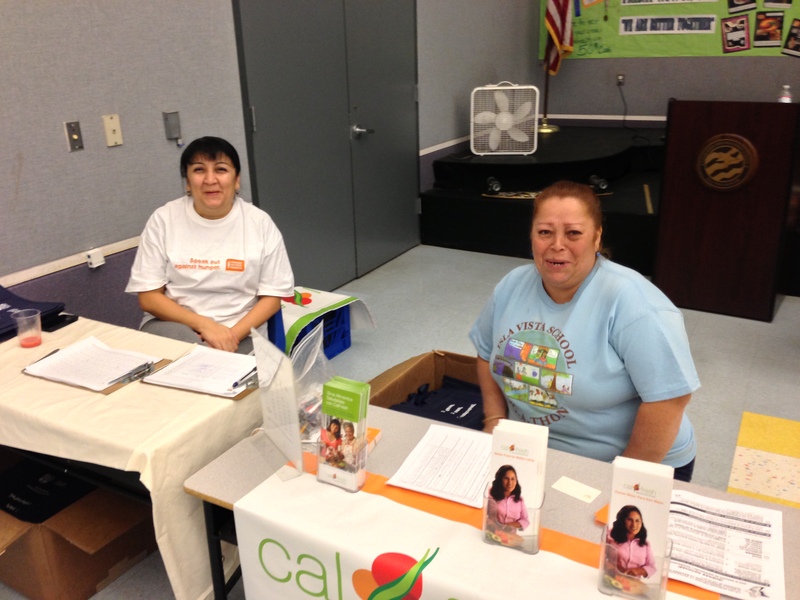 Providing this friendly and supportive range of services is augmented by volunteers who are helping us get eligible people pre-screened for food stamps. The HSP also includes a distribution of other food items and is current serving 14 schools around the county. Visiting the HSP certainly fired me up to try a new skill, which is to make up some large batches of a very healthy marinara sauce with pureed fresh vegetables, which will enable me to create a whole new raft of dishes for my next week on the Food Security Challenge. Stay tuned! 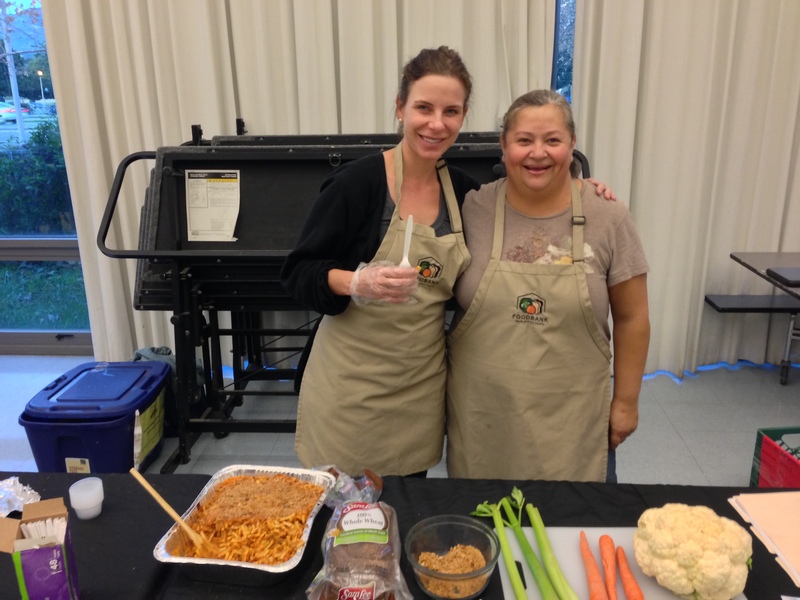 D – Salsa and chips and HSP free samples! This was great. Thanks for sharing the recipe. It is creative. I received a package of pizza sauce and was not quite sure what to do with it w/out cheese. Tried it regular pasta, but it tasted not quite right! 🙂 Great education!! I have a question maybe you can answer. I know that food stamps can be used to purchase edible plants or seeds…but never found a place that sold them who accepted EBT. Or didn’t really challenge certain stores like Rite Aid or CVS to buy there tomato plants they keep out front. Thanks for the feed back. I am looking into finding info about where you can buy seeds and plants with food stamp money. Will publish soon. You can buy seeds and plants at wal mart with food stamps, I did. 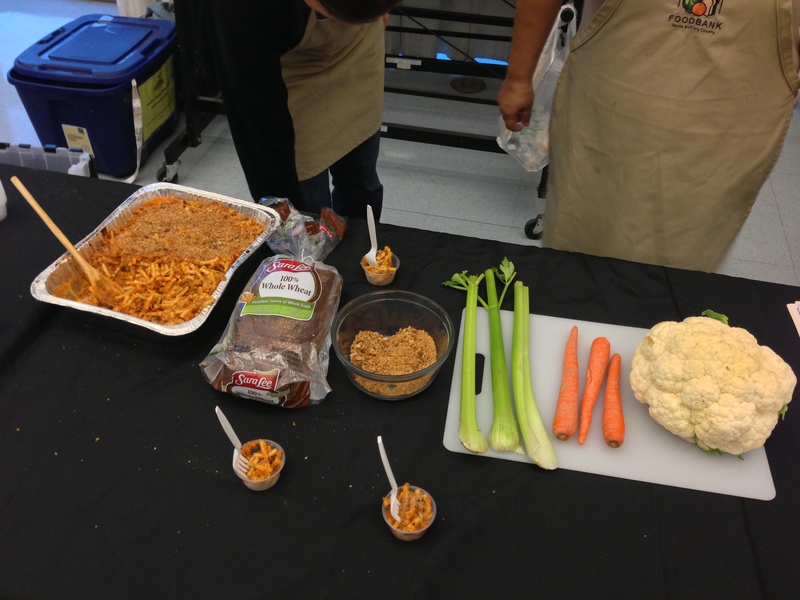 I am so glad to see that recipes and education are being shared in addition to food. I’ve often wondered what happens when people who have limited cooking skills get food that requires cooking. I’d like to see classes like Home Ec make a comeback in schools. It seems like kids are being stuffed full of data that will probably be outdated by the time they are out in the real world but are not learning basic skills like how to feed themselves and effectively use their resources. Knowing how to best use my (currently) limited resources goes a long way in helping to keep my morale up during this difficult time.